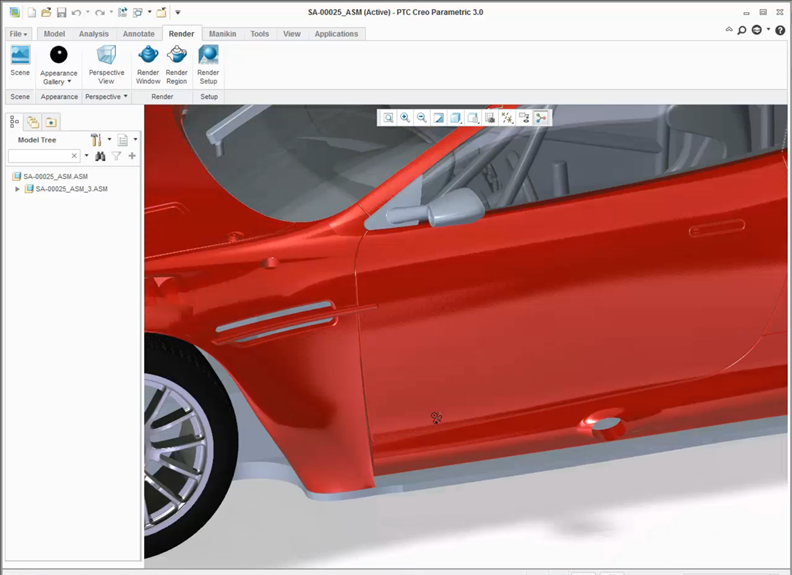 PTC Creo 3.0 offers significant improvements in graphical performance and capabilities. Shade with reflections mode has been enhanced to more accurately represent real world materials such as metal, glass, paint, and plastic. Bump maps are now realistically displayed in the graphics areas. Finally, full support has been added for HDR images that can now show realistic reflections interactively on the geometry. Over the next few blog posts, we will discuss all of these features in greater detail. 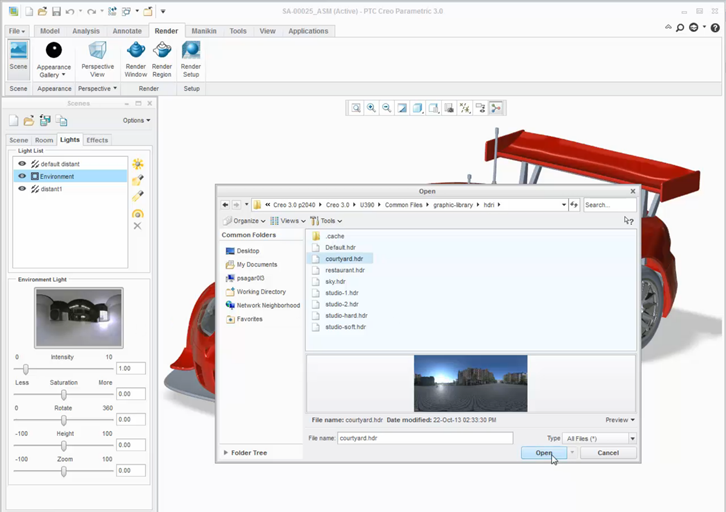 PTC Creo 3.0 allows you to fully visualize and manipulate HDR images, offering control over the intensity, location, orientation, and size of the image. HDR images are used for the background, lighting and reflections on your models. This gives you a more realistic and immersive environment in which to view your products, similar to the rendering results obtained from the PTC Creo Advanced Rendering Extension. With PTC Creo 3.0, you have full control over the environment in which your models are viewed. For example, click View and then Shading with Reflections to see high quality and realistic reflections on your models. To choose an HDR image, click Render>Scene>Lights>Environment. As these images are changed, you will notice the reflections and lighting on your model are automatically updated as well. You can also set the HDR image as the background by clicking Perspective View. As you rotate the model, the HDR image will also move. You will have the option to adjust the settings of the HDR image by using the sliders for Rotate, Height, Zoom, Intensity, and Saturation. As settings are adjusted, the model changes dynamically to help you visualize your product. 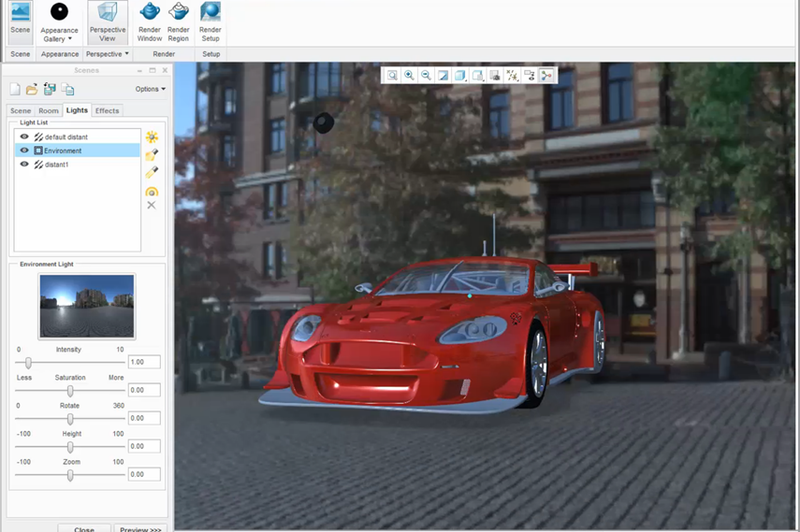 With the updated capabilities to manipulate HDR images in PTC Creo 3.0, you will be able to view an accurate representation of your product within real-world environments. Stay tuned to our “Did You Know” blog series as we cover all of the exciting, new enhancements in PTC Creo 3.0. For more in-depth product feature explanations, visit our Tech Tips area.